« Is Pretending to Open Carry a Viable Self Defense Option? What Will We See at SHOT Show 2015? It is hard to believe, but SHOT Show 2015 is less than four days away. The eagerly anticipated Shooting, Hunting and Outdoor Trade Show is the largest show of its kind, featuring more than 1,600 exhibitors and drawing tens of thousands of industry-member attendees as they seek out the next trend setting products and services in the shooting industry. 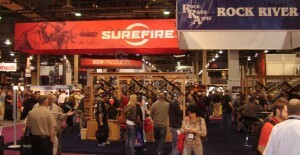 Simply put, this is the show to find out about new firearms and gear product launches. As usual, GunLink will be covering the show again this year – from the SHOT Show Range Day before the official show opening to the 170,000 square feet of show floor exhibit space. There will no doubt be many great product unveiled this year and GunLink will be covering them live during the show and continuing coverage after the show closes. So, what can we expect to see from SHOT this year? Heckler & Koch is rolling out several new updates to the handgun and long gun categories, including new HK45 Cerakote colors, the brand new USP9 Tactical, and the now-shipping MR556A1 rifle – a semi-auto version of the HK416. Range day attendees will also have a chance to get their hands on the new striker-fired VP9 pistol. Charter Arms adds another model to its Pitbull line of rimless cartridge revolvers. The stable will now include a .45 ACP model in addition to the existing 9mm and .40 S&W models. IWI US will be showing off their $1200-range UZI Pro pistols, one of which features a now-ubiquitous arm brace. A perennial hot topic is what new products Glock will unveil at SHOT. Rumors of a single-stack 9mm pistol have been greatly exaggerated in recent years, but many are holding out hope that this will be the year that it finally comes to fruition. Supposed leaked ads from Kiesler Police Supply seem to indicate that Glock will finally be introducing a 10mm long-slide G40 model – perhaps, if for no other reason than to add confusion when people call their .40 caliber pistols a “Glock Forty.” The leaked ads also include MOS versions of the G34 and G35 as well as the long-slide .45 ACP G41 that we saw last year. If you are chomping at the bit for the big Glock SHOT announcements but can’t make it to the show, be sure to check out the GlockLive broadcast. Other pistol introductions include new .40 and .380 pistols from Bersa, ported versions of the Performance Center M&P from Smith & Wesson, and a US made 1911 from CZ. 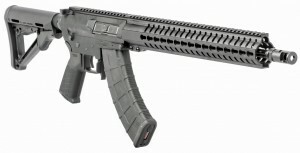 There are a number of long guns being introduced, but one thing that has us excited is the chance to get some Range Day trigger time behind CMMG’s new 7.62×39 chambered AR platform MK47 Mutant – an AR-style rifle that accepts standard AK magazines. We will also see the competition-minded Daniel Defense DDM4v11 Pro Series, built around their 18” cold hammer forged barrel, with the new SLiM Rail 15.0, a new Muzzle Climb Mitigitor, and Geissele Automatics Super Dynamic 3 Gun Trigger. Ohio Ordinance will be showcasing their $8800 semi-auto BAR while, near the opposite end of the firepower spectrum, Crosman has threatened to “put hogs, predators and whitetails on notice” with their new air gun offering. 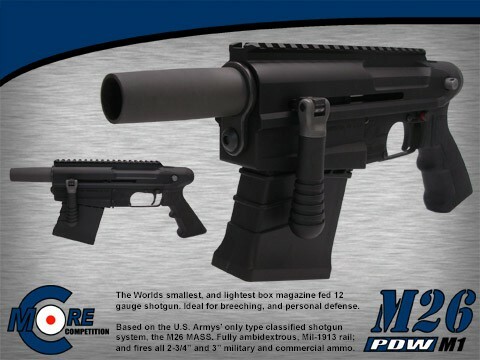 Scratching an AOW itch that you didn’t even know you had is the C-More Systems M26 MASS – a 2 3/4″ and 3″ firing, railed, ultra light weight, magazine fed 12-ga shotgun. Perfect for masochist who hates their wrists and forearms. The fact that it is fully ambidextrous will come in handy when your dominate wrist gets tired of shooting this beast – which is likely after approximately one shot. This year’s show will also feature many accessories, including new cleaning tools, suppressors from Sig, pocket cannons from Heizer, a number of new drop-in AR triggers, and the latest vaporware from Kel-Tec – sure to hit markets by FY 2023. Those looking for the latest and greatest ammo won’t be left wanting either. From trick ammo like new less-lethal and “fully lethal” Multiple Impact Bullets and G2’s R.I.P ammo to more traditional self defense ammo featuring Barnes’ TAC-XP bullet and from Sig’s new practice ammo to long range wonder-ballistics rounds, there is sure to be something to tickle your ammo fancy. Of course, SHOT isn’t just about guns and ammo either. The show is sure to feature plenty of bright lights, sharp blades, body armor, outdoor and survival gear, and much, much more. Be sure to check the GunLink Blog and GunLink Forums frequently before, during and after SHOT Show 2015 to coverage of it all.